Dubai is a fascinating city. I've only been here for less than a year, and I've already enjoyed exploring this bustling emirate. With its magnificent and towering structures (it's not the City of Superlatives for nothing), this dynamic town doesn't fail to highlight its own culture and heritage, especially its ingenuity - all of the qualities that I absolutely admire about Dubai. Below is a roundup of some of my personal and budget-friendly explorations in Dubai, along with some very interesting contributions from fellow travel bloggers. From one fellow travel enthusiast to another, Meghna and Pushkaraj of Trailing Abroad also love the area of Bur Dubai. Meghna shared that, "it can often be a challenge to explore this city of glitz and glamour on a shoestring budget. However, head to Bur Dubai and you’ll suddenly feel you have some extra cash in hand. While Downtown Dubai is exuberant, extravagant and full of luxurious indulgences, Old Dubai is rich with culture and heritage. The heart of Bur Dubai houses one of the oldest existing buildings in Dubai, the Dubai Museum. With tickets priced as low as AED 3 for adults and AED 1 for children, this one is a definite steal. The museum offers a wonderful opportunity to see what Dubai looked like without its fancy skyline when most of the city was a barren desert. After exploring the museum, feel free to walk around Meena Bazaar, famous for its open market style shopping offering cheap eateries, souvenirs, and replicas of branded bags, perfumes, and watches. It is also a delight to explore the adjacent area of Al Bastakiya where you can learn about local Emirati culture and spot forts from decades ago. 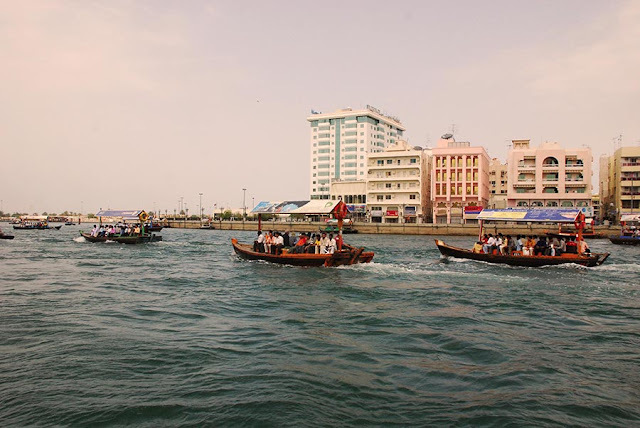 Walk further ahead to explore the nuances of the textile souk and then hop on a shared Abra (local boat) for a measly AED 1 to explore the Spice Souk and the Gold Souk in Deira, which is on the other end of the Dubai Creek." When I finally settled here, one of the first few places that my husband and I visited was the Al Fahidi Historical Neighbourhood. 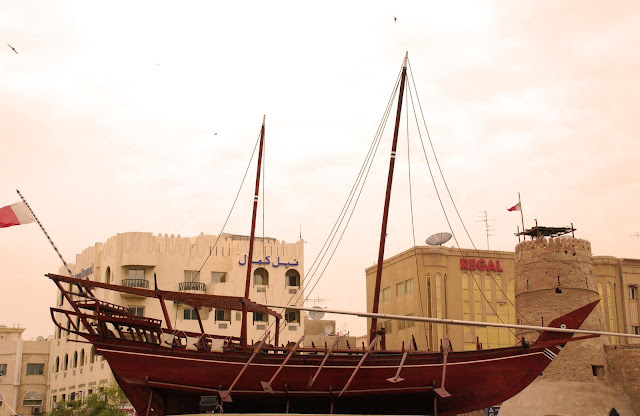 Also known as Bastakiya, this reminiscent place in Bur Dubai is one of the earliest heritage sites in the city. Here, you'll be able to see glimpses of old Dubai, as you explore its maze-like pathways and serene courtyards, as well as find a piece of Dubai's oldest wall (constructed in Bur Dubai around the 1800 AD). Check it firsthand to know more about its history. Take a walking tour of the Al Fahidi Historical Neighbourhood, and explore its old city alleys, while soaking up the history of this beautiful, traditional district. Learn more about the culture and architecture of historic Dubai by visiting today. NOTE: If you can allot a half-day for Al Fahidi, do so, as there are a lot of cultural and artistic activities that you can do while you're there. It's where you will find plenty of specialized museums (there's one on coffee and coins), art galleries, ateliers and cultural centers. You will also find several cafes and restaurants in and around the district that you can try should you go hungry. If you're a coffee-lover like me, then you will absolutely love the Coffee Museum. You'll know it's nearby when the aroma of roasted coffee beans touches your nose. It's a place that truly showcases the connections between the past and the present coffee world (there's Arabic style, Ethiopian style, Japanese style, etc.). As you go around, you will find a variety of roasting and brewing styles from different countries. There are some live demonstrations as well, to see how the coffee beans are prepared from seed to your cup. Apart from that, antiques from all over the world are seen displayed in the two-story gallery. You can also buy some of these at the museum shop, along with other coffee related items. A coffee shop can also be accessed on the second floor if you'd like to just chill and bask in the aroma-filled setting. After a good few hours of exploring Al Fahidi and the souks nearby, we headed straight to Dubai Creek to ride the Abra. I was a bit apprehensive about riding one, given that there weren't any life vests in the boat. I just uttered a prayer that nothing bad would happen, as the boat made its way to the other side. Fortunately, the trip only took a few minutes before arriving at our destination. The Dubai Creek was alive all day long. We found several Abras sailing along the river with passengers in-tow, some alighting at different sides of the creek. Dhow Cruises were also present and were heavily decorated with lights. It was actually a nice sight, especially at night. COST: Abra ride is AED 1 per person. The Al Seef Marina was a bit far from where we lived. But it was definitely worth traveling to. I loved that the area displayed the city's deeply-rooted culture and maritime heritage (it's also along the Dubai Creek) smoothly merging into urbanism. When we arrived, the sky exuded a lovely blue and gold sunset. 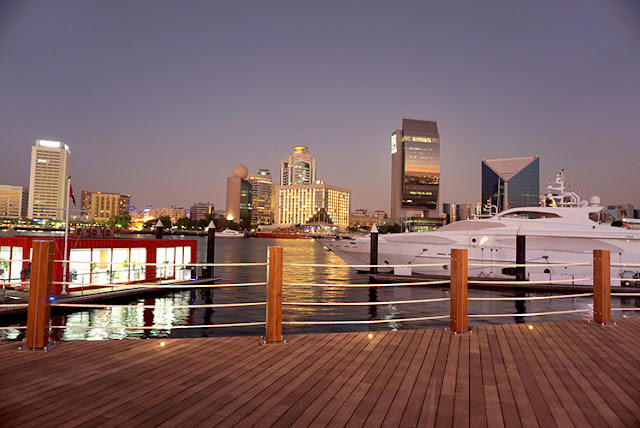 The view of the marina with all the yachts, Abras and Dhow Cruise boats docked by the water's edge, whilst set amidst a background of towering structures, made the entire panorama glow in unison. It was quite peaceful despite the influx of people. Even the cold January weather complemented the entire experience. *Do check out our Photowalk along Al Seef Marina, too! Arzo of Arzo Travels shares that, "while Dubai has many lovely areas that you can visit for free, one of my favorite areas is Madinat Jumeirah. 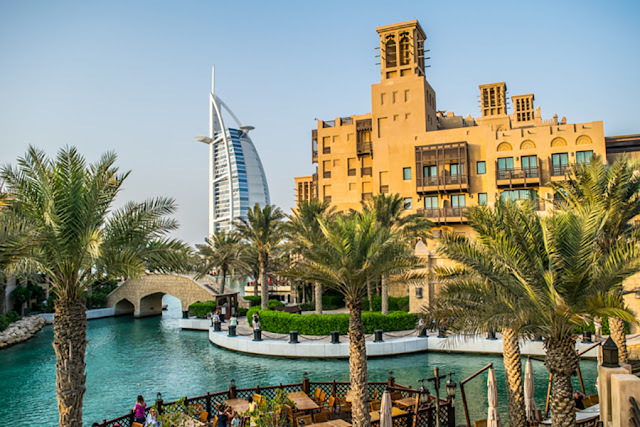 Madinat Jumeirah is a recreation of ancient Arabia and is located close to the world famous man-made island called The Palm, which has many little shops and restaurants. Though these restaurants and stores are not the most budget-friendly and are home to many luxurious hotels, getting lost in Madinat Jumeirah is totally free. One of the nice things that I do, whenever I have time, is pass-by the bridges and stroll along the water. One of the best things here is the view that comes with it. In Madinat Jumeirah, you have some nice views of the Burj Al Arab (often voted the world's most luxurious hotel). After all, looking at it does not cost a dime and the views from there are just pretty." I love Madinat Jumeirah. While there are plenty of pricey restaurants in the area, you can still find spots where you can hang out and admire the scenery at bay. You can watch the boats that sail along the man-made river or view the Burj Al Arab from afar. But if you'd like a closer look of the 5-star hotel (sometimes incorrectly labeled as a 7-star), walk a little bit further, and head to Jumeirah Beach - another destination that won't cost you an arm and leg. There are plenty of leisure and entertainment centers in Dubai, that each one has its own distinct design and offerings. When I first came to Dubai, I was immediately awe-stricken by these state-of-the-art establishments. Listed below are just some of my favorite go-to places in the city. COST: ALL OF THE ESTABLISHMENTS BELOW HAVE NO ENTRANCE FEES. Your expense will solely depend on your choice of food and activities. If there's one mall in Dubai that I absolutely enjoy going around in, it would be Ibn Battuta Mall. It's quite accessible, as it's connected to the Dubai Metro (towards UAE Exchange). My husband and I, during our free time, would make it a point to rediscover the pathways of this shopping center because of its interesting decor and story. You can walk along its hallways while you shop, and be enthralled by the many destinations that Ibn Battuta visited during his days of exploration. The mall, which was named after him, narrates his journey that spanned twenty-four years and six different lands: Tunisia, Egypt, Persia, India, China, and Andalusia. Elena of Passion for Dubai shares that, "Dubai Mall is one of the largest shopping malls in the world. This shopping paradise is Dubai’s number one entertainment hub. You can easily spend a whole day here, shopping in one of the hundreds of shops, ice skating, dining and exploring the souks. Dubai Mall houses a few of Dubai’s most visited attractions, like the Dubai Aquarium, which has an impressive tunnel filled with sharks and stingrays. It's also where you can watch over 33,000 aquatic animals. You'll also find the Dubai Fountain in this mall, which is the largest of its kind in the world. 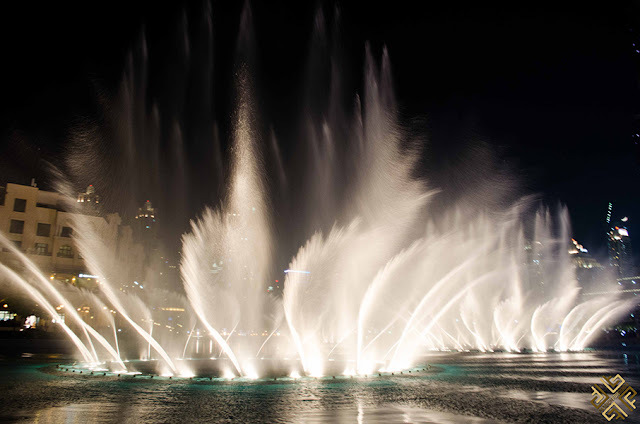 Thousands of visitors gather here daily to experience the majestic fountain dancing and moving to a show of light and music. It plays from 6 to 10 pm on weekdays and from 6 to 11 pm on weekends (the weekend in Dubai is Friday and Saturday). It’s an incredible event that you can watch for free. You can also sit down for dinner at the Souq Al Bahar, which features an Arabic-style market architecture with stone walkways, high archways, unique textiles, and interesting shapes. It's where you can marvel the Dancing Fountain show, along with the backdrop of the world’s tallest building, Burj Khalifa." The Mall of the Emirates is considered as one of the largest malls in Dubai. It's also where you will find the famous Ski Dubai, an exclusive place where you can experience winter in the desert. 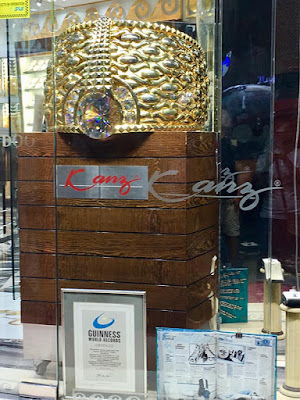 Apart from that, you'll find a good mix of affordable to luxury items in this shopping and entertainment center, as well as an array of international cuisines that will suit different types of budgets. My favorite go-to eateries in this mall are Shake Shack, Jollibee, Koryo, Din Tai Fung and the Cheesecake Factory. City Walk is a charming place filled with designer shops and restaurants. But that's not all there is to it, as it also offers scenic views of the towering structures in the city, including Burj Khalifa. Still, what's interesting about this leisure center are the beautiful murals on the walls, which you'll find at various locations. Seeing these artworks would definitely work as great conversation pieces when strolling the European-style streets of City Walk. If you would like to see an outdoor mall that is different from the rest, head to Box Park, where all the shops are literally made out of shipping containers. Its vibrant and hip industrial exterior is definitely a refreshing sight for both residents and tourists. Not too far from Box Park is the famous Dubai Water Canal (about a 10-minute walk from the shopping center). I specifically enjoyed this lovely destination, as the area was quiet and clean. It even had its own USB charging ports (attached to the streetlights), which you can use for free. The Wi-Fi connection in the area was complimentary as well. Then again, why go online when you can savor this lovely setting, which is perfect for those early morning runs or evening strolls. While there's plenty more development to rise in this area, the Dubai Water Canal already offers picturesque views of its state-of-the-art pedestrian bridges, all of which look futuristic with their vibrant lights and remarkable architecture. 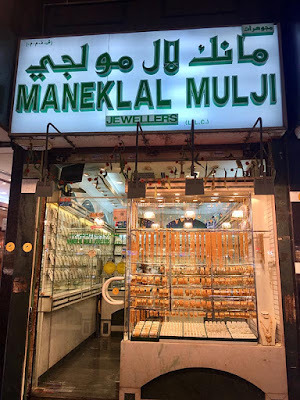 According to fellow travel blogger Verity of Veritru, "the best place in Dubai to go on a budget is to visit the Old Souk (where you can barter to your life's content!). I love finding little gems wherever I go. It's where you will feel the contrast between the new age malls and skyscrapers from the souks. It’s not very large, but you can easily spend an afternoon wandering around this area of Old Dubai. Everything in the New Dubai is bigger, better, taller or more expensive; that sometimes, all you want is to be immersed in the real place, where you'll find that beautiful little pot, some exotic spices, and that interesting painting by a local artist. Well, that’s what we ended up with anyway. Right next door to the Old Souk is the Gold Souk. But don’t be fooled by the word Souk. It’s expensive there too. Then again, you can find gold in this area!" The newly opened La Mer is a lovely and hip beach destination. While the area is already open to the public, there are several shops that are still scheduled to open this year (has the same vibe like Dubai Marina). There weren't many dining options yet, so we ended up trying the Mediterranean cuisine at Mr. Greek, which was surprisingly good (delicious food and great service!). We also had a Mochi ice cream treat from M'OISHI, which were expensive but worth every Dirham! The very first place that we visited on my first day in Dubai was the famous Dubai Marina. My husband treated me to breakfast at Eggsperience, snacks at Krispy Kreme, dinner at P.F. Chang's, and then dessert at The Cheesecake Factory (their cakes are mouthwatering!). Our dining experience at the beach was something that I truly enjoyed. But lounging at the beach, with my toes in the sand, was all the more exciting. Dubai Marina is definitely a destination on its own. It's a complete package (from dining to shopping!). Bella of Whisper Wanderlust also shares that, "if you thought it was not possible to travel around the world in one day, you were wrong. At Dubai Global Village, I had one of the coolest experiences ever. Basically, I was able to interact with a small but significant part of the culture of more than 75 countries around the world. The entrance ticket, which costs only 15 AED ($4)/person includes the Eiffel tower from France, the Colosseum from Rome, the Statue of Liberty from the United States, Big Ben from England, and the Taj Mahal from India. You'll also discover the aromas of the Arabic cuisine, the beautiful Persian carpets, the beautiful Indian dances, the delicious Turkish delights and many more. Here, you will find a small representation of each country. You also get the chance to enjoy all the main monuments and buildings around the world (but on a smaller scale) without the need for a visa, and without buying expensive airplane tickets. Besides all this, inside there is also an amusement park, an artificial river, and many shows and other activities that will entertain guests. Global Village is definitely an experience that I would recommend for you to try when you travel to the luxurious city of the United Arab Emirates." COST: 15 AED per person if you purchase your ticket online. Another destination in the city that I haven't been to yet is Miracle Garden. 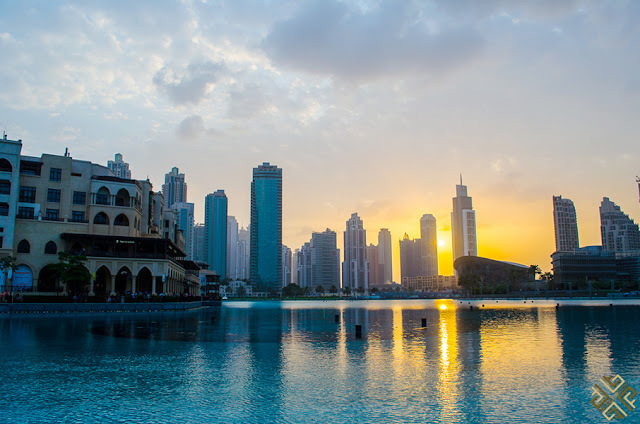 But Alexis and Bertaut of World Travel Adventurers have been there, and they've shared that, "it's one of Dubai’s lesser-known budget-friendly attractions and is incredible to visit! It is 40 AED (so about $12 USD) for admission, which is on the cheaper side for Dubai. Miracle Garden is a desert oasis of 45 million flowers, which is astounding in the middle of the Arabian desert. It won the Guinness World Record in 2013 for the world’s largest natural flower garden. Miracle Garden has so many amazing flower displays that will blow your mind, from giant peacocks to houses made of flowers. There are displays that kids will love, including Cinderella’s carriage and giant ladybugs. 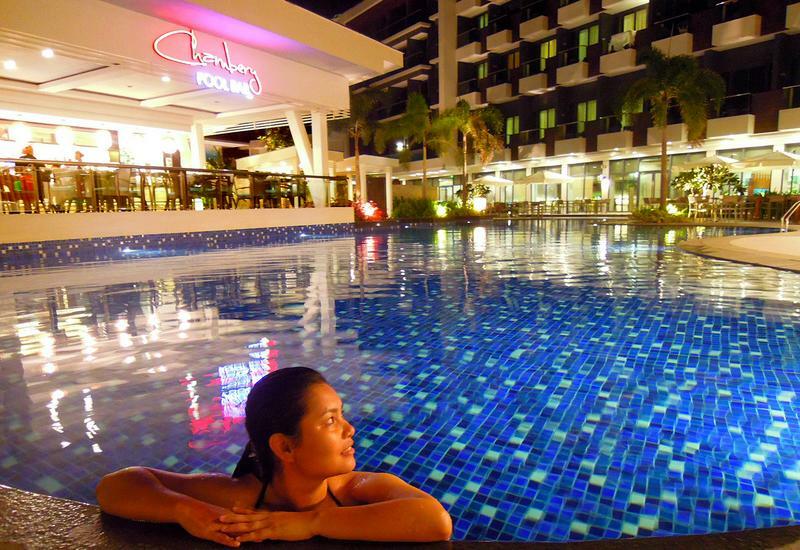 It is also great to visit for couples because of the romantic ambiance. 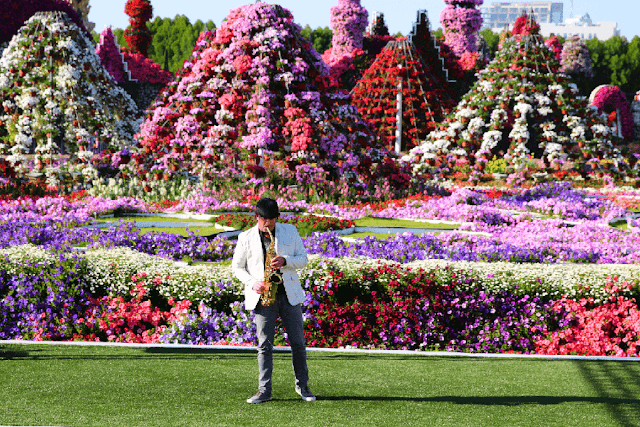 We enjoyed a live saxophone while strolling amongst the impressive floral displays. If you are into gardening, you could easily spend your entire day there soaking in all the beauty. 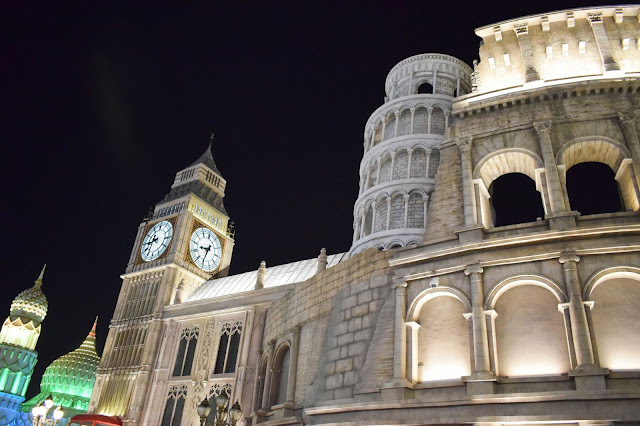 We spent about 3 hours before heading over to Global Village, which is nearby and another budget-friendly Dubai attraction." The first time that I've heard about Alserkal Avenue was through a scheduled photography class at Gulf Photo Plus. I may not have gone around, but a fellow traveler, Clemens of the Travellers Archive explored this appealing Al Quoz area. He shares that, "Dubai turned a four and a half hectare site into an art and cultural destination: Alserkal Avenue. "An investment in Dubai's future," says the founder. Fourteen galleries have moved in, a small theatre and a vintage furniture store. In the central A4-Space, where visitors can relax after a gallery tour, one can find bio-cappuccino sold in paper cups, hip chill-out corners with bean bags and colorful post-its on the walls. The look really has nothing to do with swanky Dubai clichés, rather something with hipster Berlin. The exhibitions, which feature Gray Noise, the Third Line Gallery, or the Ayyam Gallery, showcase strong works by artists from the Middle East, like the works of Charbel-Joseph H. Boutros from Lebanon for example." One of the things that I've been meaning to see in Dubai are these Flamingos. I found myself immediately planning a trip to Ras Al Khor Wildlife Sanctuary after reading Helen's experience. The lovely travel blogger behind Helen On Her Holidays shares that, "if you’ve grown tired of the glitz of Dubai and fancy getting back to nature, head out to the Ras Al Khor Wildlife Sanctuary. 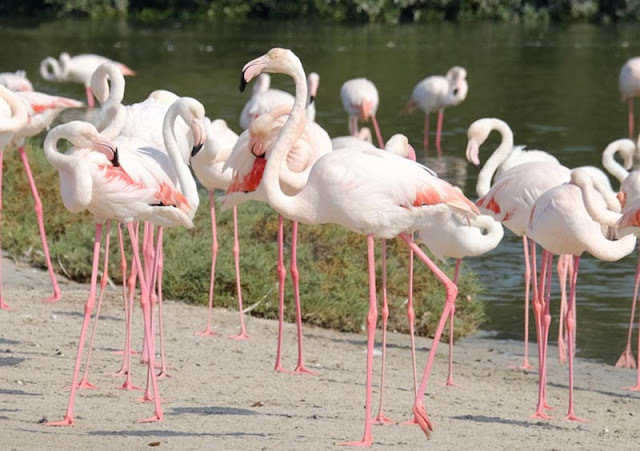 Just 20 minutes in a taxi from Downtown, the sanctuary occupies a marshy bend of Dubai Creek and is home to 67 different species of birds, the most flamboyant of which are hundreds of wild flamingos. From the small car park next to one of Dubai’s busy highways, walk down a narrow, sheltered path to the hide. In the hide, you’ll find information about the flamingos and some binoculars - make sure you take your camera! When we were there something spooked one of the large groups of birds and they all suddenly took off, showing their bright pink wing feathers. It was like nothing else you can experience in Dubai. The sanctuary is open every day except Friday from 9 AM to 4 PM. But the best time to go is at feeding time - the flamingos are fed twice a day, once at around 9.30 and once at around 3pm. And best of all, entry to the sanctuary and the hide is absolutely free." Nuria of Where's Nuria expressed that the Jumeirah Mosque is worth a visit. She shares that the place of worship is "located in the up-market beach area of Jumeirah. This impressive mosque is one of the three mosques in the UAE that is actually open to non-Muslims. Let alone it is the most beautiful and most photographed one in Dubai. The mosque itself is not big. In fact, it only consists of a very big and detailed room.That if you ask me, it is reason enough to visit it. 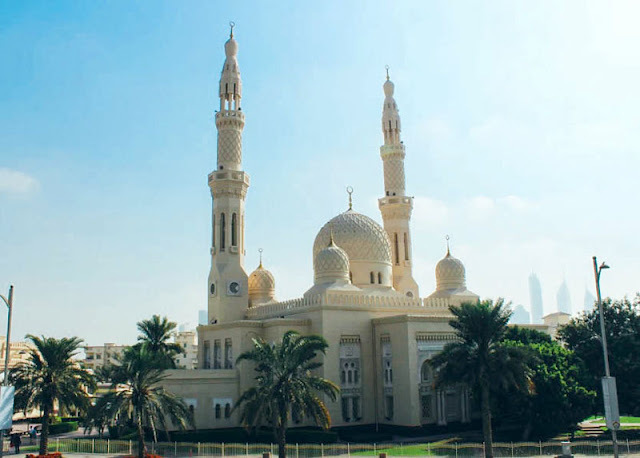 You can visit the mosque by joining the tour that takes place at 10 AM for the reasonable price of 20 AED (less than 6 USD), when apart from visiting it, you will learn loads about the Islam and Emirati cultures. At the end, it comes with a delicious breakfast including Arabic coffee and tea, dates and traditional pastries. The icing on the cake!" 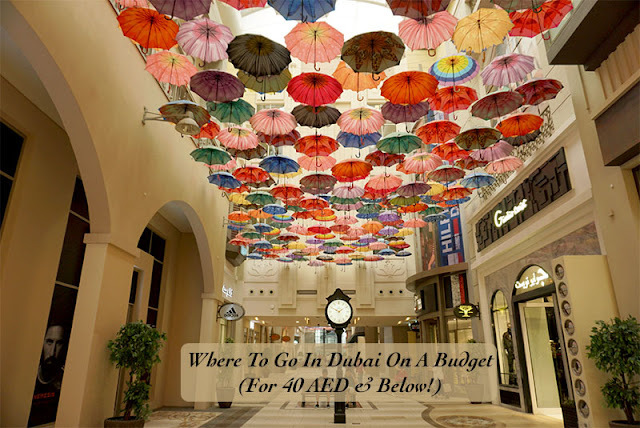 These are just some of the places that you can visit in Dubai for under 40 Dirhams. Have you been to any of these destinations in the city? Comment below if you've been to these sites or are planning to visit real soon.